Our craftsman friend who put the word "timberframe" in our vocabulary is doing a lot of the architectural trim work for our house. 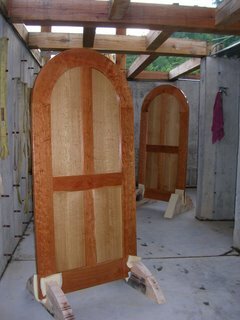 These are the first doors that he made for us... we love them! The panels are made of quartersawn white oak that I logged and cut on my sawmill. The frames are cherry (not from our farm). The door in the foreground has a lot of quartersawn "ray fleck," whereas the door in the background looks more rift sawn. Each of the four 12 inch wide panels in the doors is made of book matched 6" boards. 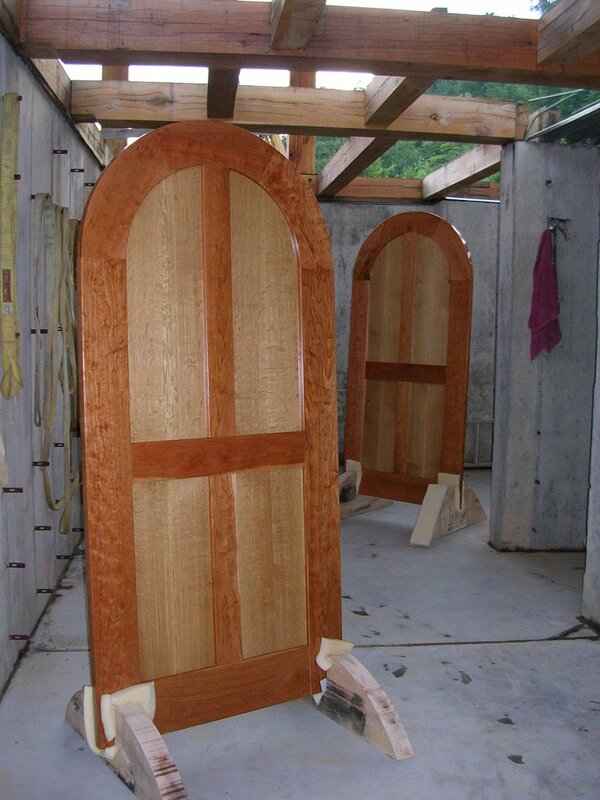 These doors will just exactly fit inside arched braces that frame the entrances to two of our children's rooms. There are so many things going on with the west side of the roof right now that I thought I'd just take a picture of the whole scene. Today, two of my wife's brothers installed the first of three skylights into the roof structure (right side of picture). It took them about an hour to decide to throw away the installation manual (one of those freaking tri-lingual deals), and after that, things went pretty smoothly. Actually, I think it was an all-day struggle, but they got-er-done. They hooked the skylight to the generator and tested the remote control open/closing feature, the automatic water-sensing closing feature, and the blinds. Just before they installed it 32 feet above the great room, my wife realized that the time to stain the wood frame was _now_, so she slapped a coat of stain on it. Just-in-time-staining means that my brother-in-law's finger prints are now imortalized in the window frame, but who's going to notice? The window is a Velux brand skylight, and we were all amazed at the engineering and build quality of their product (trilingual manual notwithstanding!). On the low-tech side of things, I went into the woods today with "S" (please, let's just call him "S" for now - you wouldn't believe his real name!) with the John Deere 750B dozer and snaked out three white oaks and a yellow poplar. These were trees that I discovered yesterday while (successfully) hunting for Chantrelle's and Oyster Mushrooms. The poplar must have fallen in the past 6 months, because I found it laying across the road that goes up the middle of the holler. Two of the white oaks were trees that I had staged in the woods after the ice storm, but had completely forgotten about (they were _deep_ in the holler). The third white oak was a standing dead tree that I cut today because my dozer has 4 chokers and I didn't want to skid out only three trees. 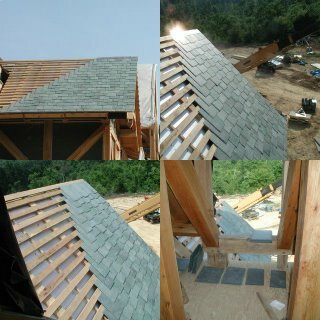 We took most of the logs to my saw mill and started making more 3x3's (for the "subfloor") and 1x4's (skip-sheeting slate nailers for the roof). The sap-wood in the white oaks was completely rotten, but on mature white-oaks, the sapwood is only about 1" to 1.5" thick, so the logs we cut made plenty of perfectly sound heart-wood lumber. On the west side of the roof, you can see some other things going on (or not going on!)... 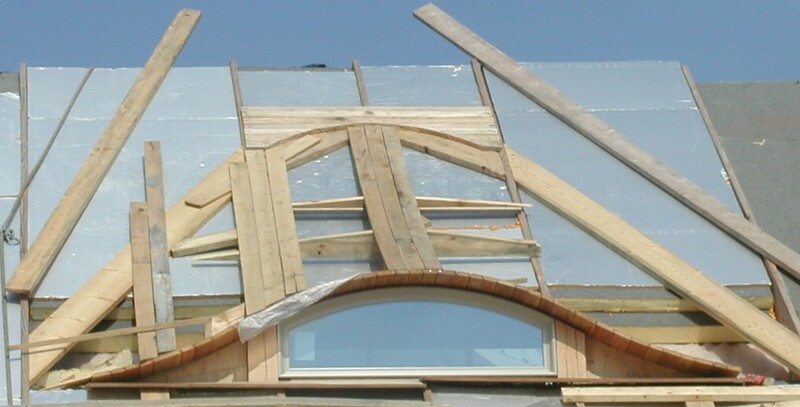 for instance, I've pretty much stalled on the framing of the outside of the eyebrow dormer. The inside was a piece of cake compared to this. The eyebrow dormer deserves a chapter, but I don't know how the story's going to end, so I don't want to get it started. Some of the difficulties that I've run into are "how to deal with the 10 inch thick roof" and "how to get the boards to lay flat on both the main roof and the eaves of the eyebrow." I think I've solved the first problem by building a shelf into the roof, just below the eyebrow dormer, and I'm dealing with the second problem by using 1/2" green oak boards instead of 1" dry oak boards... the boards must twist in order to fit!. "I'm trying to match 5 dimensional tangency conditions while maintaining continuous first and second derivatives." The leftmost dormer (also shown in the picture) looks like a shed dormer, but that's only temporary. We're waiting on the SIPs to arrive before we can frame the dog-house on top of this particular dormer. In fact, that's the big story of this project right now - WE'RE WAITING ON THE SIPs which are being manufactured in Indiana as I type this (I hope!). 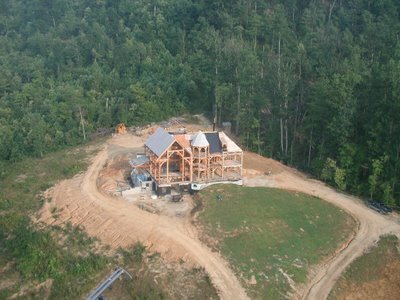 We are really shooting ourselves in the foot by trying to roof this house without the SIPs attached to the timberframe. The overhang of the finished roof will preclude the use of the crane when it comes time to install the panels. But I've got to get started on the roof, because my temporary roof (and permanent vapor barrier) has been baked by the sun and just last week spontaneously disenegrated into thousands of pieces, thereby exposing my prefinished tongue and groove. Egads, just look a the picture. I'm trying to take some comfort in the fact that it looks worse than I want to believe it is. It was the SIP company that suggested I could go ahead and install my tongue and groove ceilings and put down the vapor barrier as temp roofing until the panels arrived. But I'm the goof-ball who listened and thought it was a good way to keep the project moving. I wouldn't recommend this approach (putting on your t&g without the wall panels already on site) to anyone. 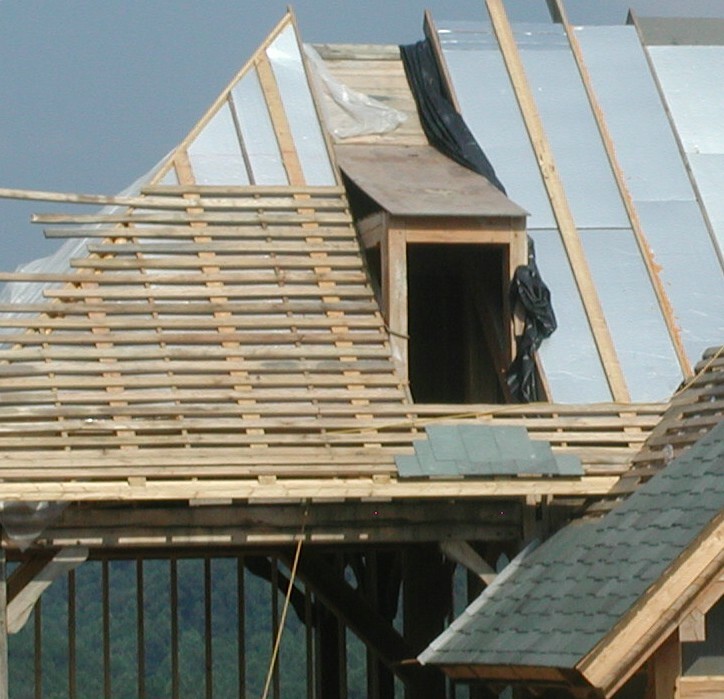 Specifying and receiving the Structural Insulated Panels (SIPs) has been a slow process, and I'm starting to think it's not the silver-bullet for timber frames that the Timberframe/SIP industry proports it to be. (at least not for owner-builders) By contrast, the infill section (site built) of our timberframe went blazingly fast and cost a lot less. But the jury is out on this... 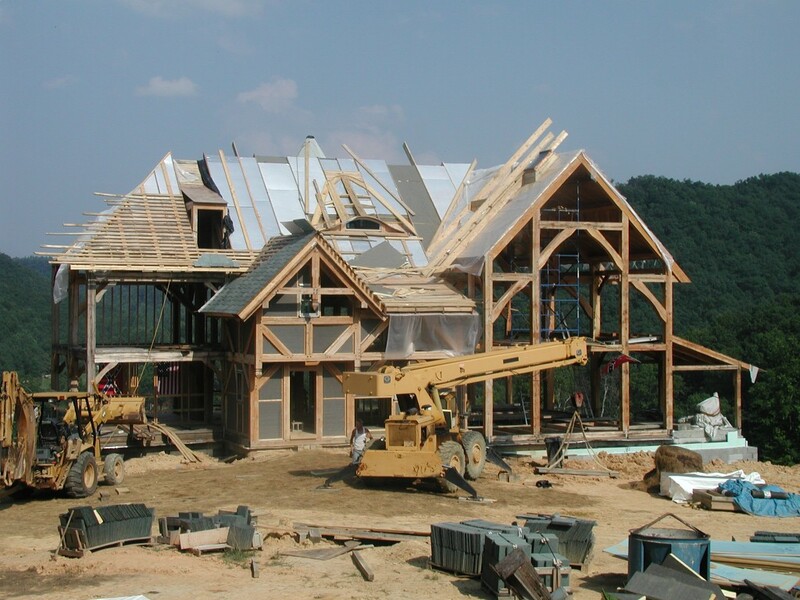 I'll wait for the SIPs to arrive before giving my final opinion on "the best way to enclose an owner-built timberframe house." So that's where we are. 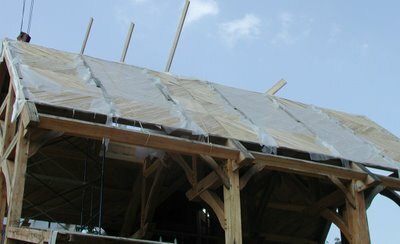 Jumped the gun on the tongue and groove, vapor barrier disengrated, knowingly shooting ourselves in the foot by putting on the roof now, still going in the woods to get wood, waiting on walls to show up. But we're still having fun! Every 5 years or so, they spray the trees on the giant power lines that stretch through our county. Although the power lines don't cross any part of our property, our field makes an excellent central LZ for the helicopter that does the spraying. AEP was glad to have a flat place to base operations for a couple of days, and gave me a helicopter ride across the 4 points of our property this morning. What a Trip!! I'd never flown in a helicopter before until this morning. Now I don't ever want to set foot in a plane again! 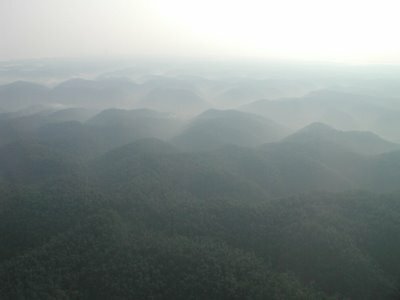 We took off at about 8:00 this morning while the fog was still hanging in the valleys. 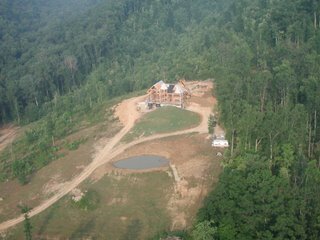 The first thing the pilot did was fly to the head of our holler and spin around so we could look down the holler at our house site. In the middle of the first picture, you can barely make out our house site. In the second picture you can see where we buzzed the house site. Things to find in this picture... an outhouse, a pig smoker, the spraying aparatus attached to the helicopter. Things to find in the 3rd picture... the hay bale that rolled into the pond and my brother-in-law's camper (which hasn't yet rolled into the pond!). With the frame for the big house done, a belated frame raising party quickly approaching, and no plumbing in sight, it was necessary to build the "little house." 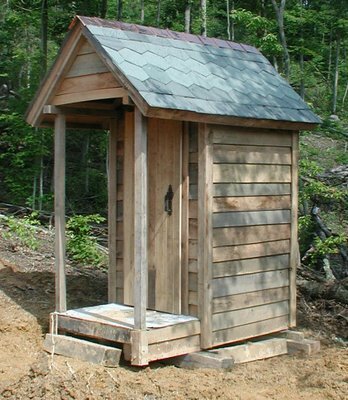 This outhouse started humbly enough, as the walls were constructed of old concrete-form panels that were themselves built of used lumber. 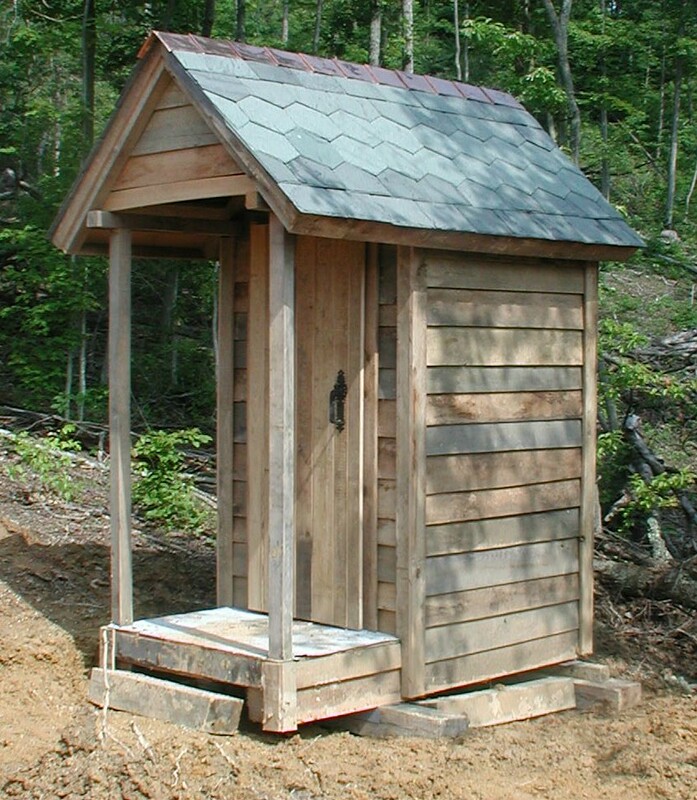 But things quickly spiraled out of control, and before I knew it, it had a slate roof, copper ridge, oak siding (thin boards we cut at the sawmill in the process of getting the exact size timbers for the house), cedar lining, and an ash door. A serious building for serious business.